In 10-inch nonstick skillet, heat 2 tablespoons olive oil over medium-high heat. Add onion, sugar, salt and thyme. Cook 8 to 12 minutes, stirring frequently, until onion is golden brown. Remove onion from skillet; set aside. Brush crust with 1 tablespoon olive oil. Spoon onion mixture evenly over dough to within 1/2 inch of edges. 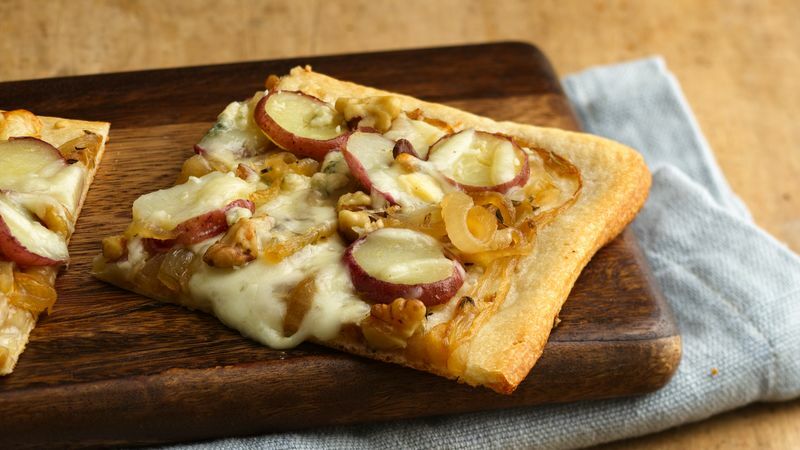 Top with sliced potatoes, Gorgonzola cheese, mozzarella cheese and toasted walnuts. Bake 10 to 12 minutes or until crust is golden brown and cheese is melted. *To toast walnuts, heat oven to 350°F. Spread walnuts in ungreased shallow pan. Bake uncovered 6 to 10 minutes, stirring occasionally, until light brown. Caramelizing onions brings out their natural sweetness.